The Black Death and AIDS: CCR5-Delta32 in Genetics and History. Click hereThe CCR5 chemokine receptor is exploited by HIV-1 to gain entry into CD4+ T cells. 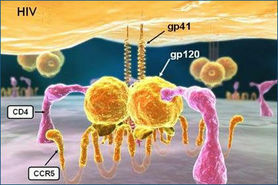 A deletion mutation (Delta32) confers resistance against HIV by obliterating the expression of the receptor on the cell surface. Intriguingly, this allele is young in evolutionary time, yet it has reached relatively high frequencies in Europe. These properties indicate that the mutation has been under intense positive selection. HIV-1 has not exerted selection for long enough on the human population to drive the CCR5-Delta32 allele to current frequencies, fueling debate regarding the selective pressure responsible for rise of the allele. The allele exists at appreciable frequencies only in Europe, and within Europe, the frequency is higher in the north. Here we review the population genetics of the CCR5 locus, the debate over the historical selective pressure acting on CCR5-Delta32, the inferences that can potentially be drawn from the geographic distribution of CCR5-Delta32 and the role that other genetic polymorphisms play in conferring resistance against HIV. We also discuss parallel evolution that has occurred at the CCR5 locus of other primate species. Finally, we highlight the promise that therapies based on interfering with the CCR5 receptor could have in the treatment of HIV. to edit.